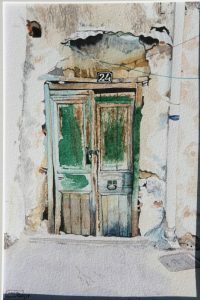 The current exhibition at the Hodgson Loom Gallery, situated within the Laxey Woollen Mill, features some unusual work this summer entitled The Eyes of the House, by former local artist David Swinton. 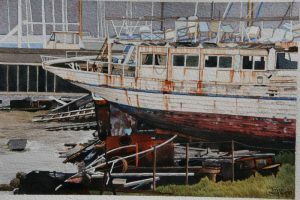 He has exhibited at the Sunday Times Watercolour Competition, the Laing and the Royal Watercolour Society as well as a number of solo presentations in both the UK and the Isle of Man. During the 1990s alone, David produced ten exhibitions which reflected his talent for painting, calligraphy, illumination, hand-writing and associated arts, which toured museums and art galleries throughout Britain – with the assistance of the Arts Council Touring Exhibitions Service. A former school teacher at Ballakermeen High School, David also received a number of commissions, which include the falcon plaque in the Isle of Man Bank, a svelte, bronze within the Villa Marina and several sets of stamps for Isle of Man Stamps and Coins. More recently his illuminated map of Kerrowgarrow Farm was officially handed into the care of Manx National Heritage, to be publicly displayed in the near future. His work follows that of other family members, who clearly influenced David; more particularly his grandfather, Dan Watson, who worked with lino blocks, engraved wood and in water-colour, and his mother, Gabrielle Swinton, a professional, botanical artist who paid much attention to detail. Although he usually paints in a broader fashion, David soon realised that the works currently displayed at the Hodgson Loom Gallery demanded extra detail, so as to express their full character. 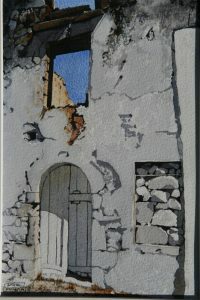 He worked from tonal sketches and several photos of each subject, which were based on ideas from the UK, Crete, Spain and the Isle of Man during the past eighteen years. It was his grandfather, meanwhile, who influenced the title of his latest exhibition, and the long term visualisation of both doors and windows as ‘the eyes of the house’. David also revealed that he has enjoyed painting this body of work more than any other in recent times. Also included with the exhibition is a panel showing the water-colour techniques David favoured for the paintings on display and a helpful list of colours from his palette. Now retired, David has been selected as Artist in Residence for several schools within Cambridgeshire, Bedfordshire and Norfolk during the last ten years, utilising paper sculpture, wood-carving and concrete for commissions and school workshops. 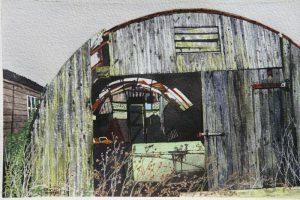 A solo show of water-colours at the Peterborough Museum and Art Gallery during 2016 also proved to be a best-seller. His current exhibition at the Hodgson Loom Gallery closes on the 11th August, 2018.